To Democrats, Senate candidate Doug Jones' stunning projected victory in reliably Republican Alabama is more than a quirky one-off. Instead, party leaders cast the upset as a sign of growing nationwide momentum among voters opposed to President Donald Trump and an indication that Democrats shouldn't shy away from competing in Republican territory. Democrats were bolstered in particular by the higher turnout in Alabama among African-Americans, particularly women; young voters and voters in urban areas, along with a diminished GOP advantage in some small towns and rural areas. 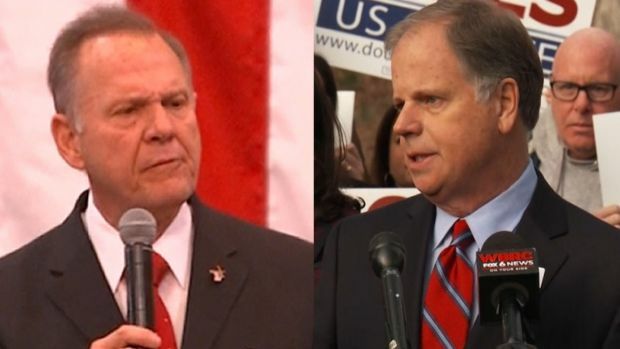 The Alabama returns track other high-profile elections where Democrats have pulled out victories this year, including the governor's seat and other statewide offices in Virginia, and several dozen state legislative seats around the country. "We're feeling the sunshine from Alabama all the way in Washington state," said Gov. Jay Inslee, who chairs the party's gubernatorial campaign arm. "We're seeing a passion for voting (and) this phenomenon exists in every state. It will expand the universe of competitive races." Certainly, Alabama's Senate contest presented Democrats with a unique set of circumstances, most notably the accusations of sexual misconduct against GOP candidate Roy Moore. The allegations against Moore split the Republican Party, with Trump robustly backing the former judge after initial hesitance, and other party leaders calling for Moore to step aside. Even so, Jones' projected 1.5-point win was stunning given that Trump won Alabama by 28 points just 13 months ago. And Alabama tilts far more heavily toward Republicans than many of the House districts and states Democrats will aim for in the midterm elections. The Senate and House line-up for 2018 still poses real obstacles for Democrats as they seek a path back to the majority. But party officials also see opportunities on the horizon to flip enough seats to reclaim control of Congress, dent GOP advantages in statehouses and diminish Trump's political sway in the final two years of his term. Democrats need to flip 24 seats for a House majority. National Democrats have a target list of about 90 seats, including the 23 Republican-held districts that Trump lost to Hillary Clinton in the presidential race. In the Senate, Democrats must defend 10 seats in states where Trump won. With Jones' upset of Moore, they need to net a two-seat gain, and see opportunities in Nevada, where Trump lost, and Arizona, which could be a toss-up. "Obviously the path to a majority got a little wider, but it is still a long and winding road," said Maryland Sen. Chris Van Hollen, who runs Senate Democrats' campaign efforts. Republicans already were set to defend open governor's seats in traditional battlegrounds like Michigan and Ohio. But Inslee said the Alabama results highlight openings in GOP-held Kansas, Oklahoma, Tennessee, Georgia and South Carolina, among others. In Kansas, Democratic chairman John Gibson said his party has strong candidates running for three of the state's four congressional districts, one of which yielded a surprise single-digit loss among four similarly close special congressional elections this spring in GOP districts. Kansas Democrats also have a competitive primary for governor amid widespread dissatisfaction over outgoing Republican Gov. Sam Brownback's sweeping tax cuts that curtailed spending on education and infrastructure. One key takeaway for Democrats after Alabama: the party can plunge resources into GOP-leaning states to help candidates, but shouldn't always make their presence known in places where an affiliation with liberal party leaders can be a turnoff to some of the voters they need to win. Tom Perez, the chairman of the Democratic National Committee, said the party offered data support and staff to Jones, but did so far more quietly than in states like Virginia. Perez said the DNC spent $1 million on the Alabama voter turnout efforts, including registering college students to vote, sending text messages and phone calls to likely voters, and transporting voters to the polls. 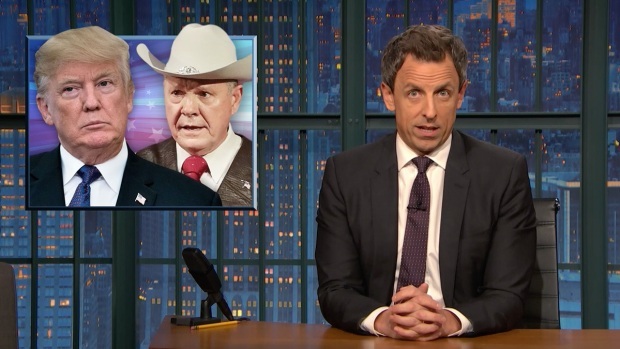 Seth Meyers takes a closer look at how President Donald Trump is pulling out all the stops to help elect an accused sexual predator in Alabama's special election. Jones' campaign also had several dozen different robocalls targeting various slices of the electorate, plus a hoard of paid staffers and volunteers knocking on doors. Advocacy groups, including the NAACP and the gay rights organization Human Rights Campaign, also joined forces on the ground to identify Jones supporters. The returns showed an uptick among the voters Democrats traditionally need a strong showing from in order to win. Black voters cast about 30 percent of the 1.35 million ballots, despite accounting for about a quarter of the eligible voters. In Lee County, home to Auburn University, Jones won 57 percent of the vote. The county has given Democratic presidential nominees no more than 45 percent of the vote since President Lyndon Johnson signed the Voting Rights Act in 1965. Joe Dinkin of the Working Families Party, a group trying to move the Democratic Party to the left, said his group sent 100,000 text messages to voters and tested almost two dozen digital ads, with the most successful being economic messages that will get widespread use in 2018. Dinkin said Alabama should encourage the left to make early investments even in longshot races. "You can't predict everything," he said. "There will be other Republican candidates who've never been vetted before and make errors. You can't take advantage unless you're there." Associated Press reporter Alan Fram contributed.